Some people spend the winter and early spring curled up with seed catalogs dreaming of spring planting in their gardens and yards. 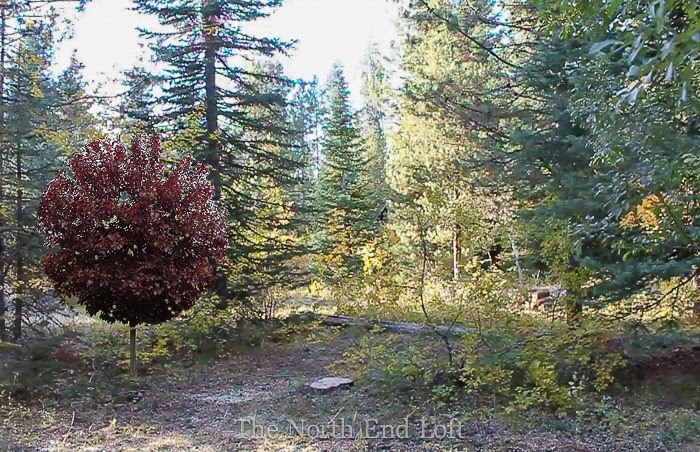 I dreamt about planting the blank slate that surrounds our cabin property once our big trees were taken care of. 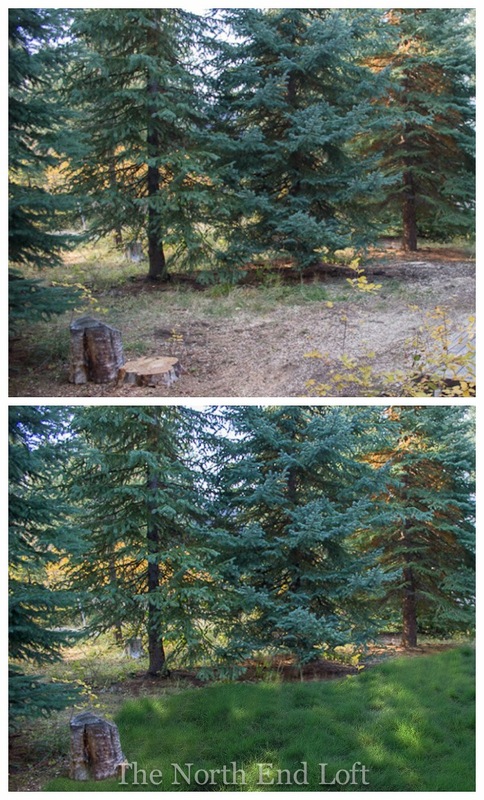 I love to play on Photoshop, and today I'm sharing some landscaping I added to photos of our bare yard using Photoshop. The "after" photos aren't real! 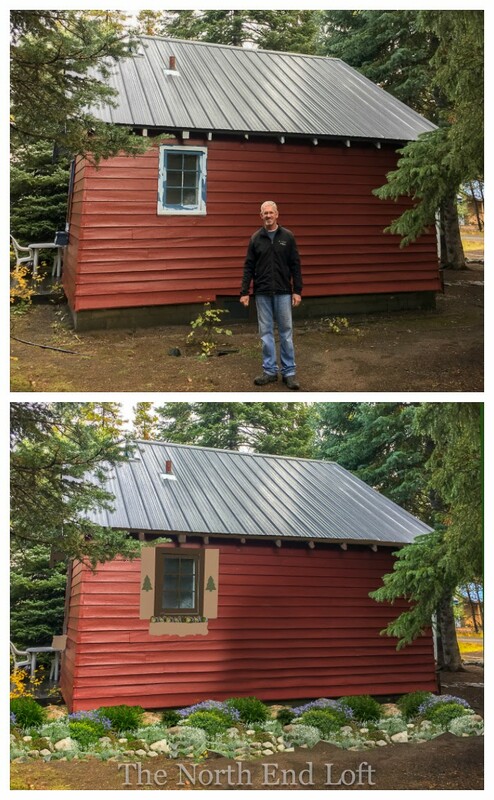 Our cabin isn't even completely painted yet, and no planting around the foundation will be done until then. I once in a while get a comment that indicates a reader thinks a photoshopped picture is the real deal. I always explain when a photo is photoshopped. Sometimes I just look at photos on blogs and don't read the text below them, too, so I'm saying it here and now, these after photos are not real! They're my plans created on Photoshop. I've had so much fun learning about the unique requirements of high Rocky Mountain landscaping. Bulletin 862 about short season high altitude gardening by the University of Idaho Extension (available online in a .pdf file you can download) was invaluable, and I think most, if not all, the flowers, shrubs, and trees we plan to use came from their lists of plants native to Idaho. It was essential we chose plants that could survive our winter snow loads as well as plants needing no additional summer watering, since we have no automatic irrigation system and sometimes no one is at our cabin for weeks at a time. We also don't want to spend our vacation time weeding, dividing, and deadheading, so we're choosing simple care-free options. If you have a cabin or vacation home in a similar growing zone (3b) I hope our plans will give you some ideas, and as always, I'm still learning and welcome your comments. 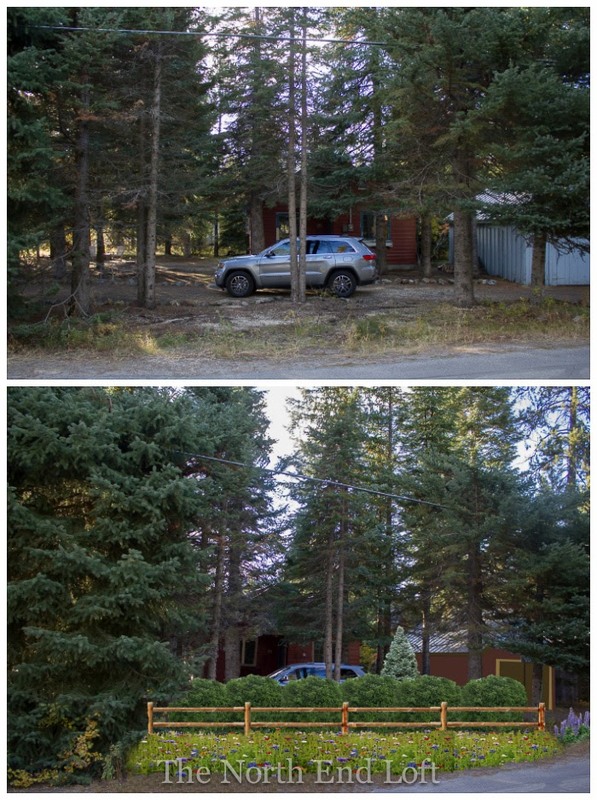 When we bought our cabin in the fall of 2016, it was screened from the road by a solid line of tall evergreen trees. They had been topped by Idaho Power twice, and more than half of them were already well on their way to dying. Our tree care specialist recommended taking the dying trees out in phases so we could maintain some privacy while replanting. Eventually, every tree in this row will die and need to be cut down. Even though we were prepared to lose the trees, it was a shock to suddenly be so exposed to the road. These are some "before" photos on top followed by future planned and photoshopped "after" photos on the bottom. Replanting this area is our highest landscaping priority. We like being able to see the forest across the street now, so we have chosen a hedge of Red Twig Dogwood shrubs that will grow to about ten feet tall. One white fir tree looks lonely now, but will eventually grow up to 20' wide. 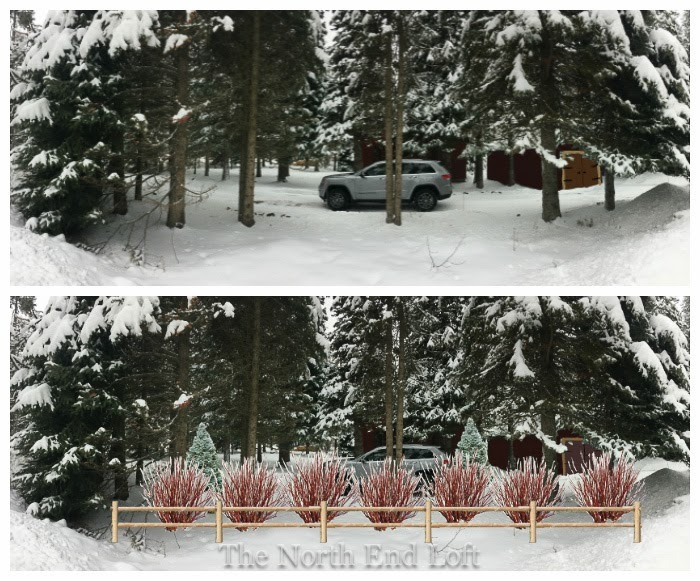 The split rail fence section will be added to protect our bushes from the city snowplow. No-care perennial wild flowers that die back in the winter will be sprinkled in front of the fence. As the rest of the topped trees die and are removed, we'll continue this landscaping all along the street. During the winter the Red Twig Dogwoods will still maintain our privacy while adding beautiful color and interest. 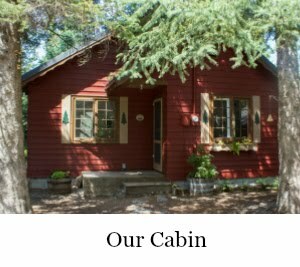 The front of our cabin gets very little light because there are three huge fir trees growing here. 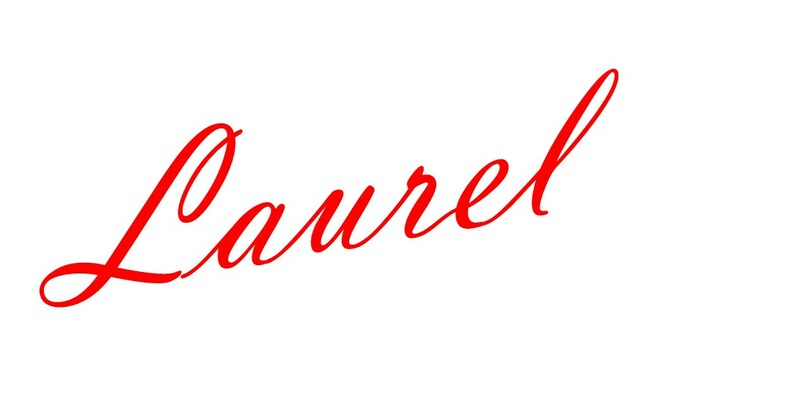 For along the foundation we will plant native ferns and in the whiskey barrels, drought tolerant fountain grasses. We'd love to grow colorful flowers here, but we just won't be around enough to keep them watered. We'll try succulents in the window boxes, but if they need more water than they'll get, we'll just fill them with pine cones and moss. We love to watch the bird feeder from our front window and will add a birdbath under the trees in the summer. We're also thinking about building a box around all the ugly electric cables. 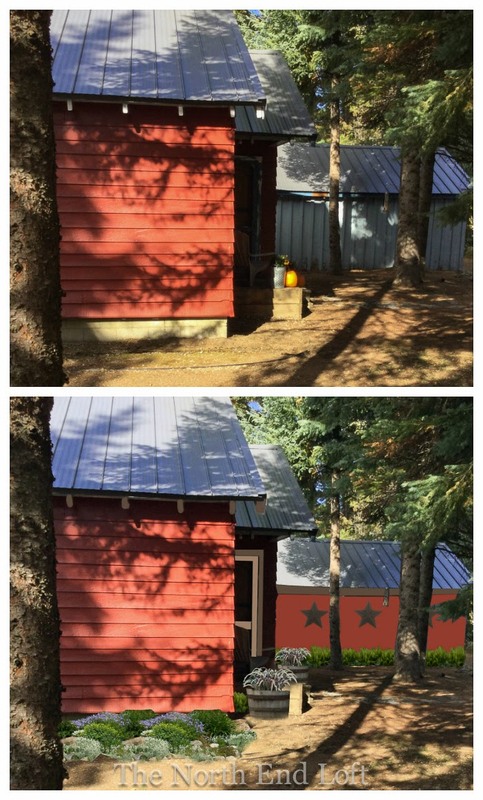 I photoshopped some paint and metal stars on the garage where the ferns will be continued under the shady trees. Gosh, I can't wait until all the painting is finished! 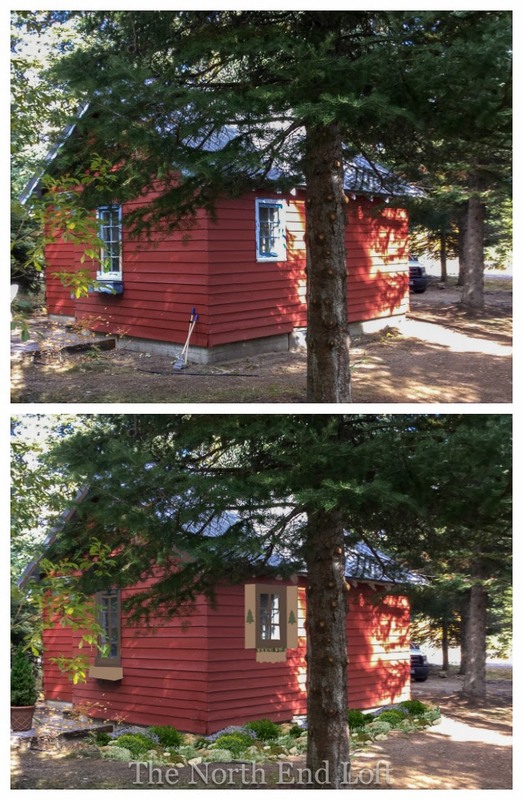 The south side of our cabin gets some pretty intense sun in the summer afternoons, so we looked for a sun loving solution. In addition, this side gets an enormous snow load from the snow sliding off the roof in the winter that would break shrub branches. We also have a melting snow and rain drainage problem we have to address. 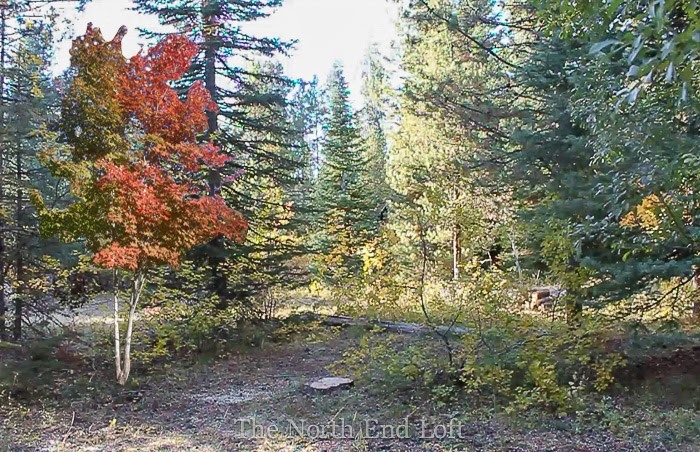 So we'll be building up the soil here along the foundation and planting a rock garden that will direct the water away from the cabin. This low scale of landscaping suits the size of our small cabin where bigger bushes would make it look even smaller, and this natural mountain theme appeals to us. We've never had a rock garden before and are looking forward to playing with it. The rock garden will continue around this sunny corner to the back of the cabin. 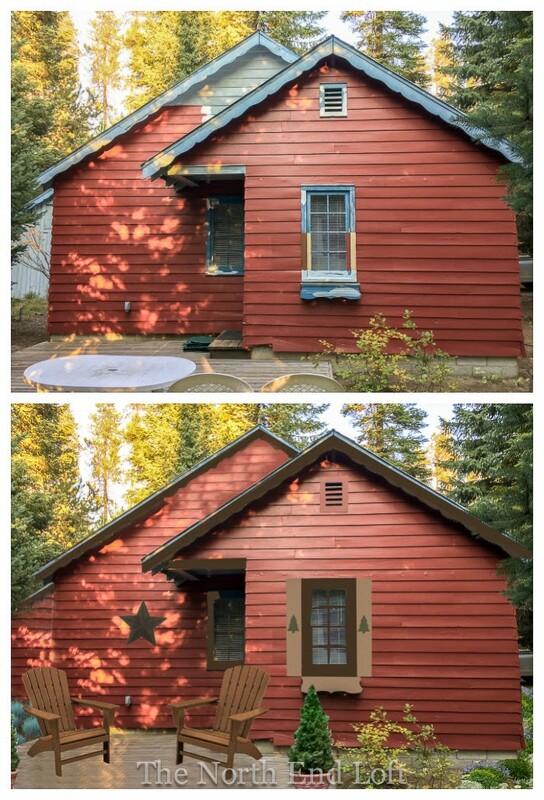 Here I've photoshopped some more paint and shutters onto the back of our cabin. We have a small deck out here where we put a table and chairs in the summer for dining outside. We'll probably add a few more potted plants out here on the deck. This smallish flat area surrounded by trees is just off the deck and the only area where we'll plant grass. It will be a native variety of grass that grows only about six inches tall and doesn't require mowing. Watering every few weeks in the summer should keep it green. 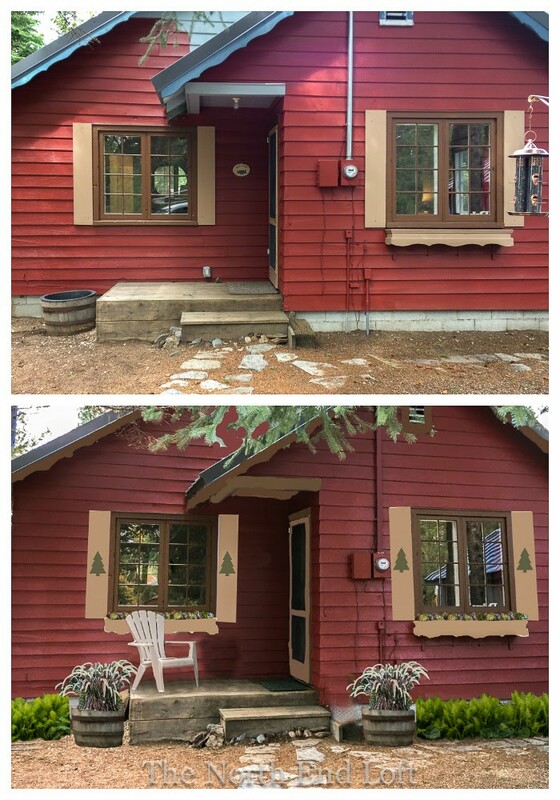 Our only neighbors have rarely visited their cabin in the summer so far, but planting a white fir tree to cover the gap in the trees between our places is a high priority. 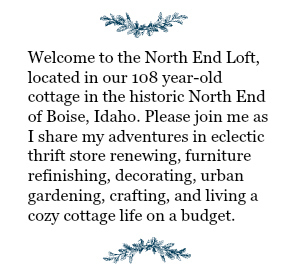 That is also the only spot I'm tempted to plant a flowering bush that requires a bit of attention; Limelight hydrangeas are rated for our growing zone, and I think one would be so pretty just in front of the new fir tree. In addition to adding some color, it would also draw our eyes down from the neighbor's roof until the tree gets tall enough to hide it completely. 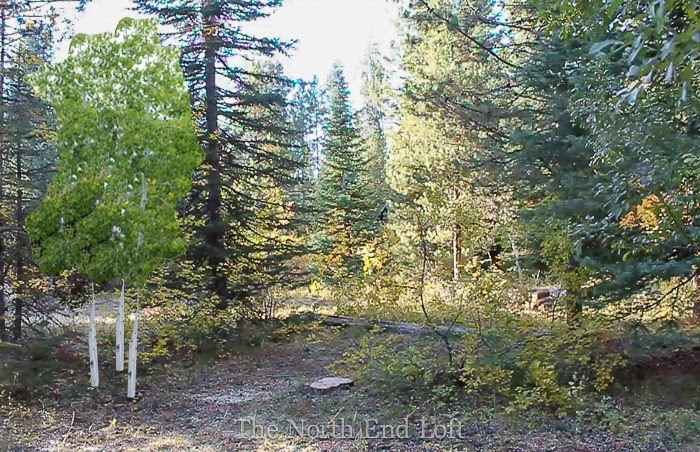 In the summer, looking out our side window, the shrub already here does a pretty good job of screening our neighbor's cabin, but we love Aspen trees and think this seldom used side yard of our cabin where no raking of leaves is needed, is the perfect spot for a few Aspens. They'll be beautiful in the fall when they turn bright yellow next to the red sumac that's already here. On the ground between our cabin and the Aspen trees we'll plant some easy care Blue Fescue. That's it for our landscaping plans for right around our cabin. 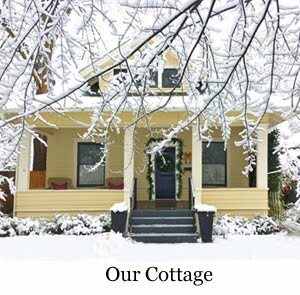 We would also like to add a few of our favorite deciduous trees from the native plants list sprinkled here and there around our little conifer forest away from the cabin where the leaves can fall naturally without needing to be raked up. Here are a few of our favorites. All of these trees would add color to an otherwise mostly green landscape, especially in the fall. And there you have it. 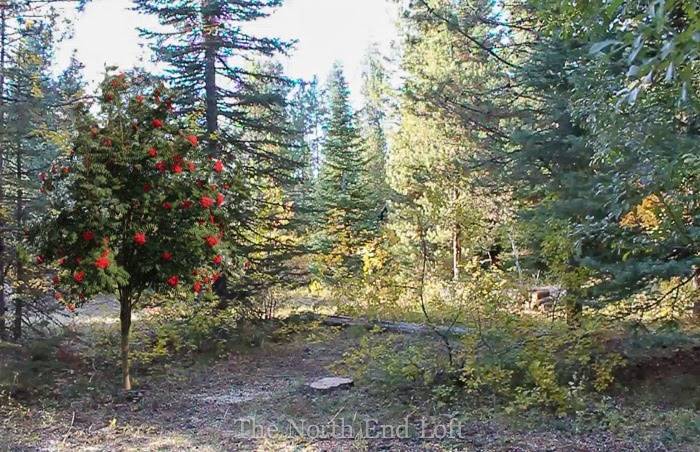 Our dreams and plans for landscaping our McCall, Idaho mountain property. It will not happen all at once, and the plans will probably be modified as we go along, but isn't that part of the fun of gardening? Now that the work of making our little forest healthy and safe has been completed, we hope to get started on our planting in places where it won't interfere with finishing up the painting of the cabin. We might even get some Red Twig Dogwood bushes planted this Memorial Day weekend. I'm excited! Thanks so much for coming along on our landscaping adventure the past few blog posts. For updates right from the cabin, follow me on Instagram here.